Before this review gets serious, can we take a moment to appreciate the presence of the Inside Man thematic overture? So appropriate given the plot device and that Spike Lee directed the awesome 2006 heist film starring Denzel and Clive Owen. Now back to your regularly scheduled reviewing. Spike Lee’s latest, BlacKkKlansman is on brand. It’s political. It tackles issues of race, obviously, and it features a few of his most well-known trademark tricks (like moving actors on a dolly to pull them in an eerie fashion against the backdrop). It’s also incredibly marketable, not only through its trailers and ads, but through its name. BlacKkKlansman. That singular moniker says a whole lot about the film. Yet, it also says a whole lot of nothing, if you’ve not paid attention to the full marketing campaign. It’s expository and a hook via question all in one. Titularly, more so than any of Lee’s other work, it presents questions begging answers. How can a black man be in the KKK? He’s a cop. But still, what? It’s a built-in audience builder and it deserves to be such: BlacKkKlansman’s powerful filmmaking on two fronts. One, it’s strong storytelling with compelling and relevant subject matter. And two, it’s also a statement piece that doesn’t shy from its message in any way, shape or form. In fact, it does the opposite. When its dramatic conclusion happens, as it does, with gusto, Lee hits you with the real message, one that takes a series of hints strewn throughout the film that decrease in subtlety from vague to implicit and lets you know that yes, it’s an important historical tale, but it’s also an incredibly timely commentary on the racial state of affairs in the United States. What is at first implied becomes implicit when the ‘movie’ ends, but the ‘film’ continues. It’s no coincidence that BlacKkKlansman was released on August 10, two days before the first anniversary of the events in Charlottesville, Virginia. BlacKkKlansman is the based-on-true-events tale of Ron Stallworth, the first black police officer on the Colorado Springs police force and his infiltration of the Klu Klux Klan. Stallworth (John David Washington), after finding a Klan ad in a local paper, calls up and poses as a racist white man. Eventually, the investigation progresses when one of Stallworth’s white colleagues goes undercover to play the in-person representation of the persona he created over the phone. Only, Stallworth uses his real name. Rookie. But that’s jumping ahead. Expressing an interest in undercover detective work, Stallworth is given the opportunity to pursue his passion when his chief (Robert John Burke) tells him to go undercover at a rally being held by black activists to get a sense for their disposition. Are they out to mingle, or might they turn violent? In 1979 Colorado Springs, there are all sorts of issues with race, much like today. And there’s a particularly relevant bit of speech from this rally that stands out, about young black men being shot down in the streets by white racist cops—it might as well be pulled from current headlines. 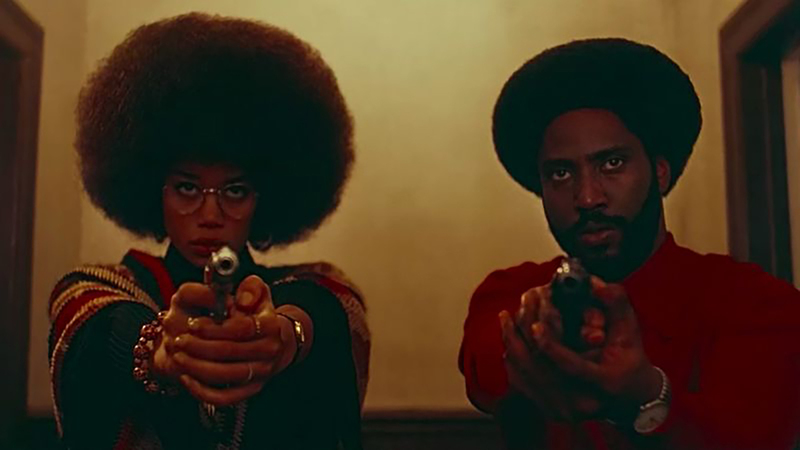 It goes with the territory, and it’s a word driven sensation that happens throughout the experience of watching BlacKkKlansman. Not because I’m white, but because the reality of the true fiction playing out before your eyes makes your skin crawl. I cringed when Lee intercut seemingly real racist propaganda footage that’s, frankly, horrific, with Alec Baldwin as a white supremacist spouting off the most abhorrent sort of hate speech. Stuff that you probably assumed existed, but never thought too hard about. I held my breath listening to a man describe a real lynching that took place in Waco, Texas on May 15, 1916. It’s historically accurate, mind-numbingly tragic, horrific and vivid in its detail. Yet the film’s power (and success) comes from Lee’s ability to cut humor into the seemingly humorless situation. It enables an audience to watch the film, enjoy it as an experience and still absorb the lessons it’s trying to impart, of which there are several. A lot of this is also owing to Washington’s performance. 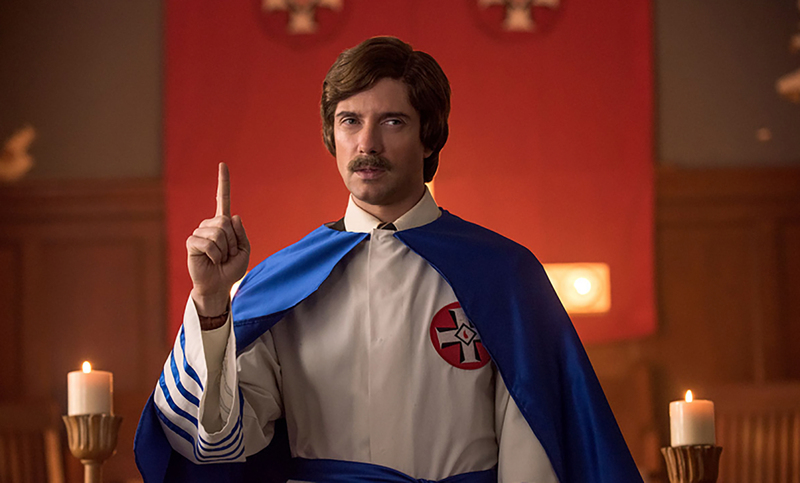 He’s wonderful, in all his speech, conviction, and in every pantomimed Kung-Fu gesture or facial expression (or lack thereof, like when Stallworth is assigned to bodyguard David Dukes, the Klan’s supreme leader, portrayed by a surprising Topher Grace). The first 30 minutes of the film felt heavy on black culture from the period, almost a celebration of it, which, given the subject matter, is more than appropriate. What better way to counteract the hate embodied in the topic than with love for that which is hated? Well, there’s the obvious appropriation of the KKK name for a movie about a black hero who subverted their organization’s own efforts; a movie made by a black director spreading a message that runs in direct opposition to everything they stand for. Yes, you could do that. 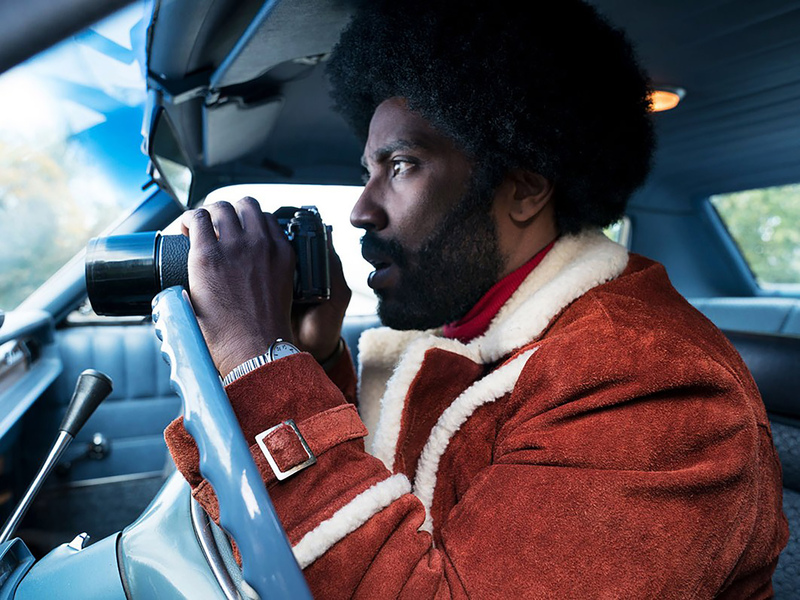 BlacKkKlansman never loses narrative drive. The emotions of the twists and turns prevent it, as does the reality of the life and death nature of the story being told. It’s not unsurprising that the tale draws towards a powerful and meaningful conclusion that rises a brief moment of triumph for Stallworth and his friends, before reality sets back in. Triumph in the moment, but the moment is fleeting and the issues that challenge society, that lead to racial strife, are not solved. An inverted American flag fades to black and white onscreen, leaving the audience in silence to contemplate how far we still have to go in this country, that while things have changed, a lot of things haven’t changed at all, or nearly enough. It’s a powerful and thoughtful moment and one that should be seen by many.